Unrest is growing in the Palestinian territories ahead of President Barack Obama’s first visit to Israel on March 20. Riots and protests have erupted throughout the West Bank and Gaza Strip in recent days, prompting some Israeli officials and Middle East observers to warn that Obama’s visit could spark a third intifada. "The Palestinians have not said the final word yet, and we expect that there will be attempts to take advantage of the upcoming events, like the visit by Barack Obama, in order to continue the violence," Israel public security minister Yitzhak Aharonovich was quoted as saying Monday by news outlet Arutz Sheva. Hamas officials have warned that Obama’s visit will further fracture its relations with the Palestinian Authority and have even stated that a presidential visit to Jerusalem’s Temple Mount will be viewed as a declaration of war. Hamas official Mushir al-Masri "called for a third intifada [or uprising] and for Egyptian assistance in the ‘resistance’ if Obama chooses to visit the Temple Mount," the site of Muslim places of worship, Arutz Sheva reported on Friday. Former United States officials and Middle East experts said that the rising tide of violence is causing great anxiety in the final days before Obama touches down in Tel Aviv. "There is a lot of discussion of this in Israel," said Elliott Abrams, a former Bush administration national security adviser. "The PA is trying to stop this from getting out of control and turning from demonstrations to violence." Hamas could use Obama’s visit as a pretense to incite violence, Abrams said. "The old rule used to be that there would be no intifada without government support, and we know [Yassir] Arafat was behind the second intifada," Abrams said. PA President Mahmoud Abbas "is trying to stop it, not promote it. But Hamas and other groups may have other plans." Obama is expected to visit the Palestinian territories as he meets with Palestinian officials during the trip. Palestinian youth organizers have called on citizens to protest Obama’s visit. "We call on the masses of the Palestinian people to change this path and demonstrate against receiving he who considers Israel ‘the closest ally in the region,' and to refuse the return to futile negotiations," a spokesperson for the youth group Palestinians for Dignity was quoted as saying Monday by the Ma’an News Agency. An estimated 16 Palestinians were injured during recent demonstrations in the majority Arab regions of Ramallah, Nablus, and East Jerusalem, according to regional media reports. Palestinian rioters threw stones and firebombs at Israeli authorities during Friday prayers at the al-Aqsa mosque, located on the Temple Mount in Jerusalem’s walled-off Old City. "Dozens of Israeli officers entered the politically sensitive area, one of Islam's holiest sites, after several hundred protesters threw rocks and two firebombs at them following Friday prayers," the Ma’an News Agency reported over the weekend. The firebombs were thrown by worshippers inside the al-Aqsa mosque, according to the Times of Israel, which quoted Jerusalem police chief Yossi Pariente as saying that the violence represents "a new level of escalation." A heavy police presence remains in the area. Islamic militants in Egypt have also begun launching military drills that include the firing of a long-range missile. Jihadists in Egypt’s Sinai region, which borders southern Israel, fired a rocket capable of travelling nearly 28 miles, Egyptian military sources told Ma'an on Sunday. "The missile landed in a desert area and left a crater three meters deep and two meters wide," according to the report. Israel reportedly moved its Iron Dome missile defense system to its airport over the weekend, according to Ha’aretz. "There were a number of riots" along a security checkpoint in the northern portion of Gaza earlier this month, according to the Meir Amit Intelligence and Terrorism Information Center. "Stones and Molotov cocktails were thrown and shots were fired at IDF soldiers," according to the report. Riots have also taken place across the West Bank and Israeli intelligence officials are reported to have "uncovered a Hamas terrorist network in Hebron," a large West Bank City. "It was directed by a Hamas operative deported to the Gaza Strip" following his release from an Israeli prison, according to the Meir Amit center. "Members of the network planned to carry out shooting attacks and detonate IEDs, but they were detained before they could put their plans into operation." Israeli military officials have been bracing for increased violence since Obama first announced his visit. "We're no longer on the verge of a third intifada—it's already here," a senior IDF official told Arutz Sheva in January. 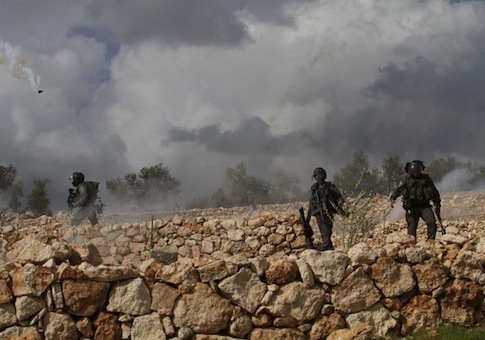 Jonathan Schanzer, vice president of research at the Foundation for Defense of Democracies, wrote earlier this year that the Israelis are preparing for the worst. "Israeli leaders are bracing themselves," Schanzer wrote in late January, when violence was also on the rise. "Officials from the left-leaning Meretz party warn that settlement plans forwarded by Israeli premier Benjamin Netanyahu are putting Israel at risk of ‘a third intifada.' "
However, other Middle East observers said the Palestinians are unprepared to wage another intifada. "While conditions in the West Bank are fragile, and it is likely some will use the opportunity of [the president’s] visit to protest, I think most Palestinians have no interest in another intifada," Matthew Levitt, director of the Washington Institute for Near East Policy Stein Program on Counterterrorism and Intelligence. Palestinian citizens are just as unhappy with the PA as they are with Israel and the U.S., Levitt said. "It is telling that the frustration on the street is directed as much at Palestinian leaders as Israelis," Levitt said. "The real concern is that Hamas takes advantage of people's frustration to build up its support in the West Bank once more." Steve Clemons, an Atlantic writer close to secretary of defense Chuck Hagel, said the percolating unrest could be seen as a cry for attention. "You get an uptick in violence because they [the Palestinian people] want the White House to raise the issue" of peace, Clemons said. "It’s a tactic to gain attention from the White House." A plague of locusts also swarmed the Jewish state ahead of Obama’s visit, according to reports. This entry was posted in National Security and tagged Israel, Middle East. Bookmark the permalink.